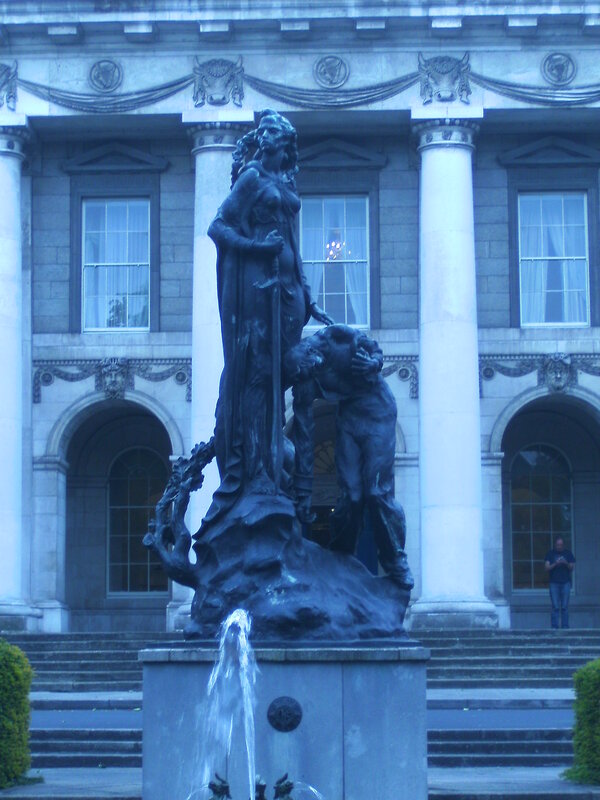 The last Custom House Commemoration that we know about was around 1985. We have heard rumours of one around 1990 but nothing has been confirmed. 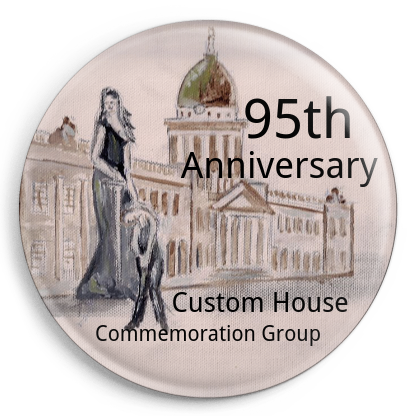 Around March 2011 we felt that the 90th anniversary of the burning of the Custom House should not go unmarked. Unfortunately we left it too late to get a proper commemoration organised, group member Gary Deering went down at the time of the attack & took a few pictures in which you can see civil servants moving around outside the building just like they had 90 years ago. Liam Grace later visited the Custom House that evening to pay his respects. The Garda Historic Group were there & had organised a talk. They invited Liam to join them so the day did not go unmarked after all. In order to try & find other relatives of the men who fought & died at the Custom House, also relatives of people who where caught up in the attack & historians & those interested in the event we set up a facebook group. The group not only brought us together, it also was a way of sharing pictures , stories & information. It also turned out that Liz Gillis & Mícheál Ó Doibhilín had been giving a talk on the burning which we did not know about and was a great way of bringing more of us together.The facebook group now numbers around 240 members with 4 admins so it is kept well on subject. Moving forward to 2012, the 91st anniversary, we were finally organised. We laid one wreath that year it was laid by Nora O`Reilly niece of the O’Reilly Brothers Stephen & Patrick (2nd Battalion) who died at the Custom House & Gary Deering, great nephew of Johnny Wilson (The Squad). The event was attended by around 16 or so people & was a great success as it was the first time a commemoration had been done in over 20 years. 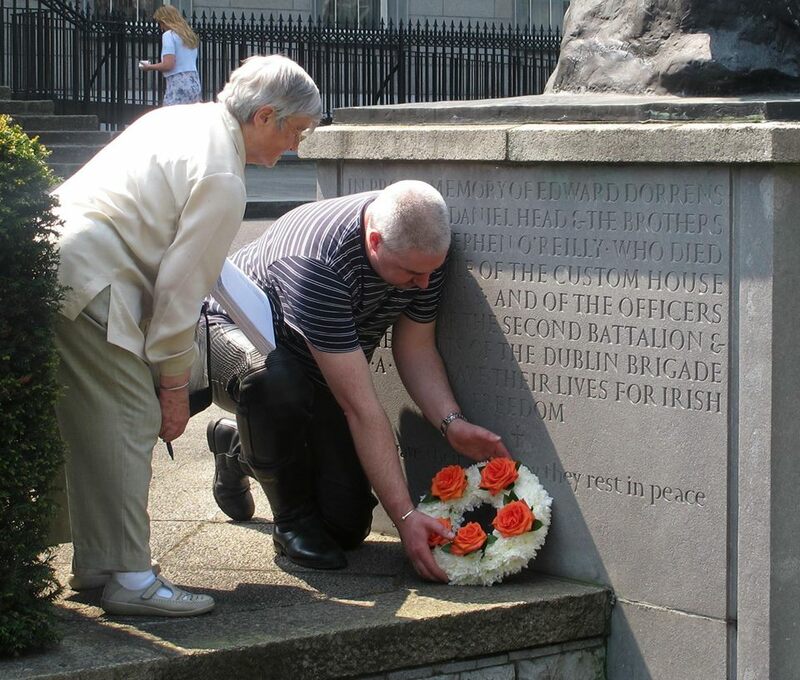 2012 Nora O`Reilly & Gary Deering Lay a wreath for the five IRA men who lost there lives at the Custom House. In 2013 we started the day off with a conference in the North Star Hotel organised by Liz Gillis & Mícheál Ó Doibhilín. The speakers included Las Fallon, Liz Gillis, Commandant Padraic Kennedy & Paul O’Brien. 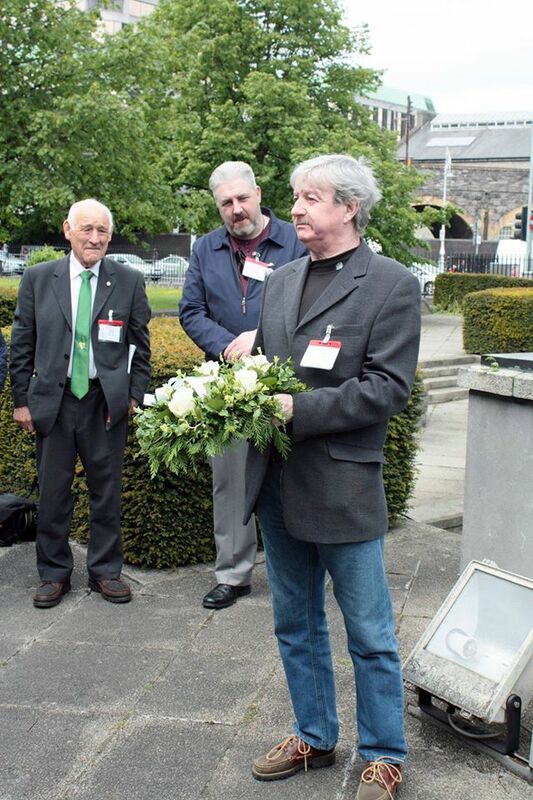 After the conference we added a new format which we have kept up – we now lay two wreaths, one for the five IRA men who died that day and a second for the 4 civilians. The wreaths were laid by Aishling Flynn and Margaret Pingram. Both are grand daughters of Philip Flynn (2nd Battalion) who fought & was captured on the day.70 or so people attended the conference & wreath laying ceremony. 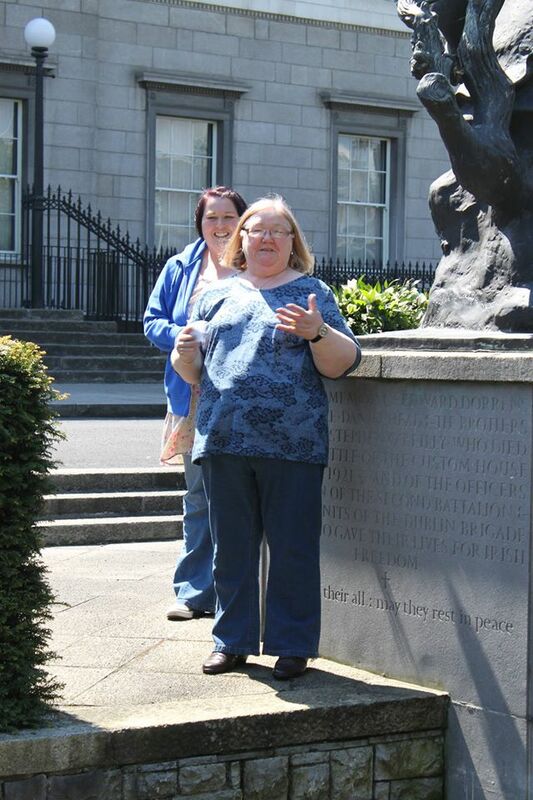 Aishling & Margaret making short speeches before laying the wreaths. 2014 again started with a conference in Cleary’s Pub, Amiens Street. The speakers on the day were Las Fallon, Liz Gillis & Mícheál Ó Doibhilín. We then walked over to the Custom House where the two wreaths were laid. This time we had a piper from Dublin Fire Brigade who played a lament for those who fought & died on the day. Another important new feature added was a minutes silence after the wreaths were laid. The first wreath was laid by Liz Gillis for the civilian deaths & the wreath for the IRA men was laid by Diarmuid O’Connor the nephew of 4 Coy ASU Commander Padraig O’Connor. Gerry Cassidy also took a group photo for the first time, so this will serve as a record for future commemorations. Numbers were down a little with around 45 or so people attending in 2014. Liz Gillis laying the Wreath for the four Civilians who died 2014. 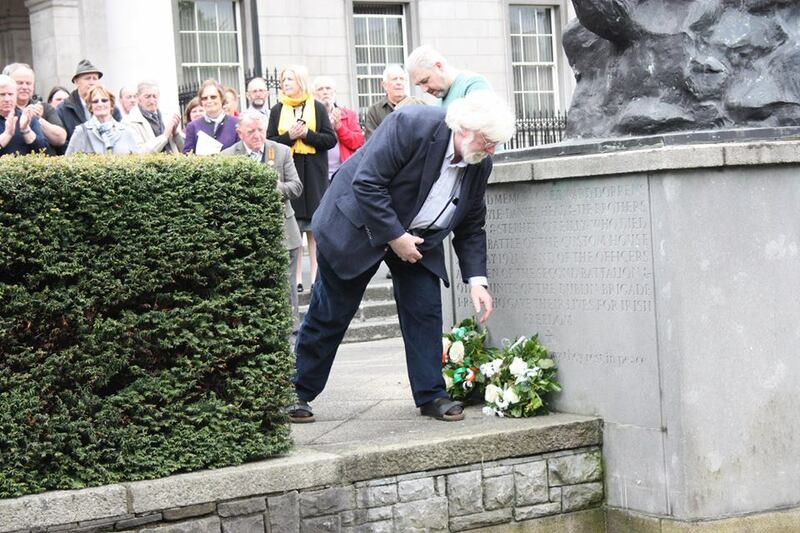 Diarmuid O`Connor laying the wreath for the five IRA men who died 2014. For 2015 we went on a similar format to 2014. With Peter Duffy son of Leo Duffy of the 2nd Battalion laying the wreath for the five Rebels who died, Mícheál Ó Doibhilín did the honours for the civilians. Numbers were well up, with 80 people attending. The conference was held after the wreath laying in the Custom House building for the first time with talks from Liz Gillis, Des White, Las Fallon and Sean Hogan (Dept of Housing, Planning, Community & Local Government, host for the event). 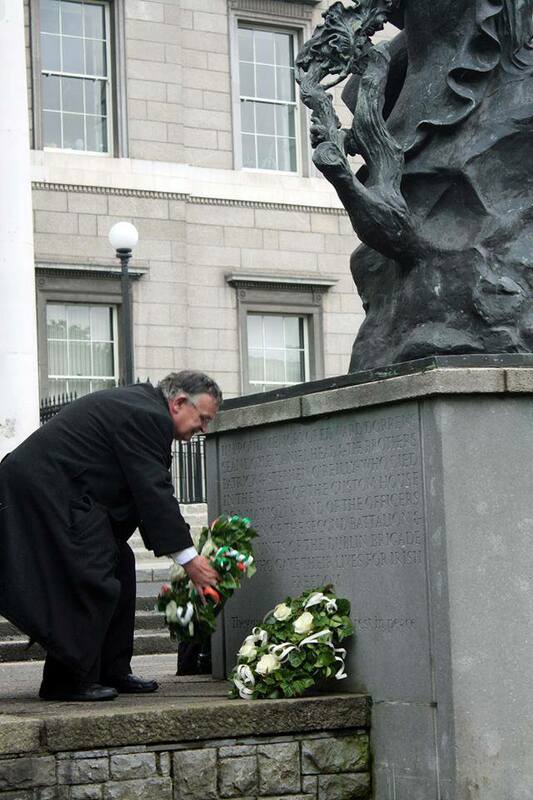 Peter Duffy laying the Wreath for the IRA dead at the Custom House. 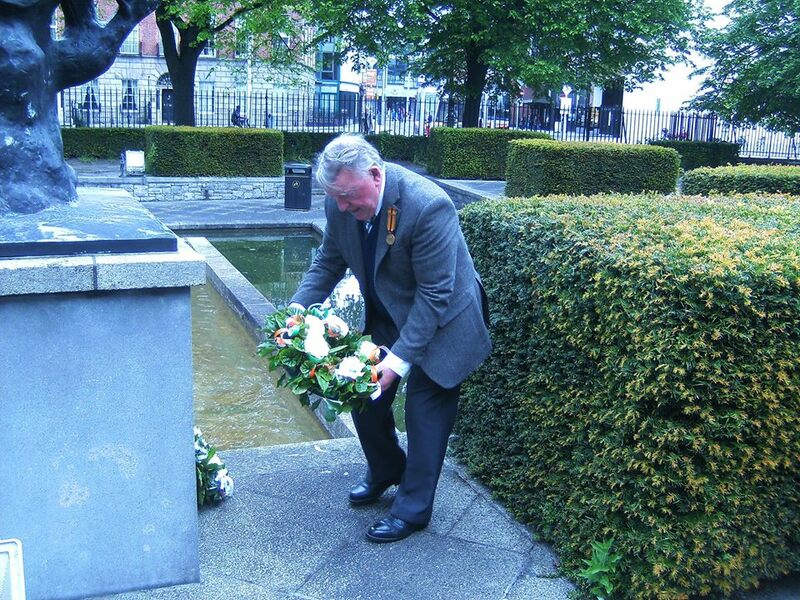 Michael O Dobhilin laying the wreath for the civilian dead 2015. 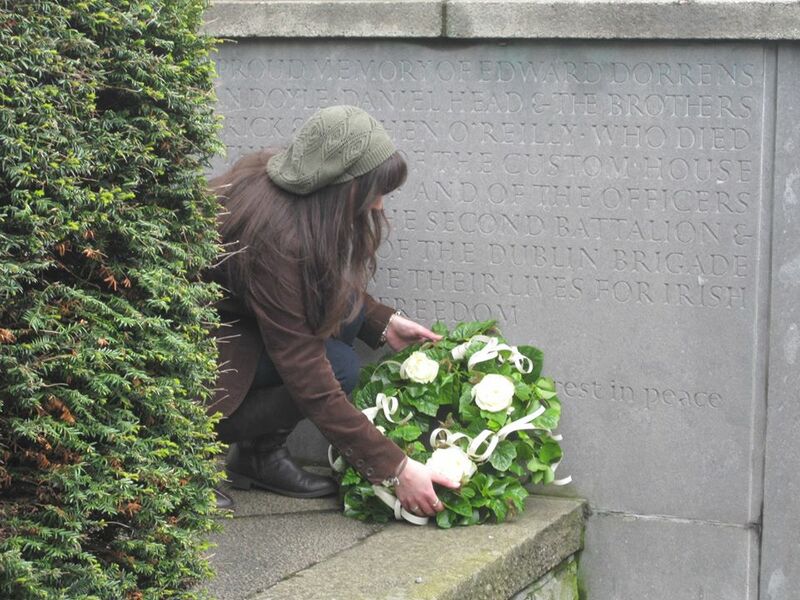 For 2016 we had a few changes in the wreath laying ceremony, including a roll of honour listing all the men we knew of who mobilised in 1916 & had a connection with the Custom House operation. 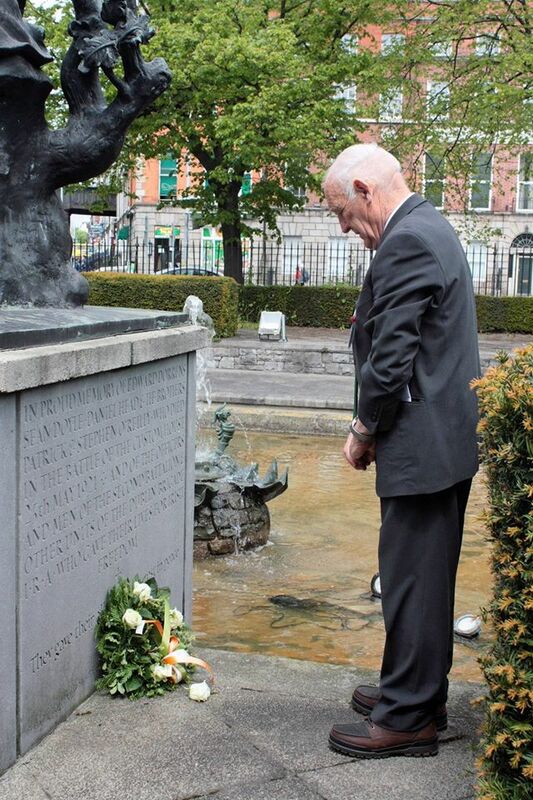 Tom Kehoe, half-brother of Tom Kehoe of The Squad laid the IRA wreath. 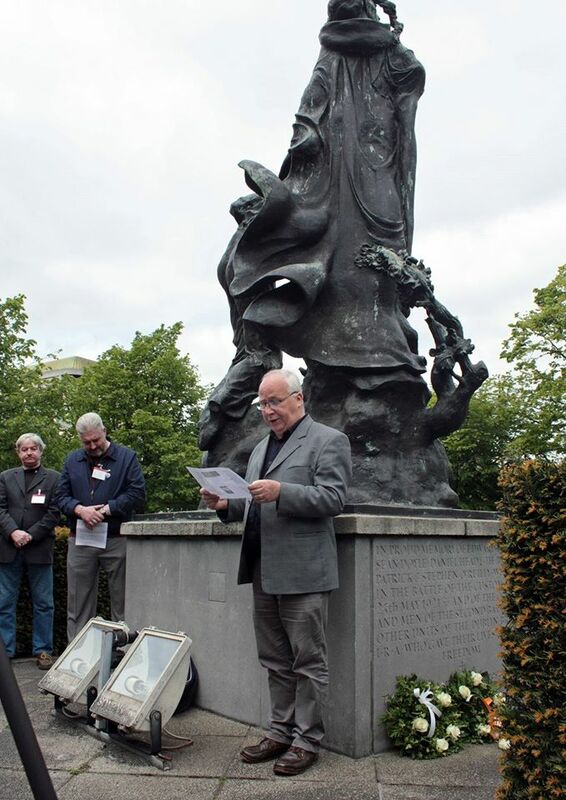 For the first time the civilian wreath was laid by a relative of one of them – Colum Lawless, cousin of civil servant Mahon Lawless killed by the Auxies at the Burning. Gerry Cassidy (grandnephew of Ned Breslin) & Nuala MacDonald (daughter of 2nd Batt Comdt Tom Ennis, O/C in the Custom House) shared reading the roll of honour. 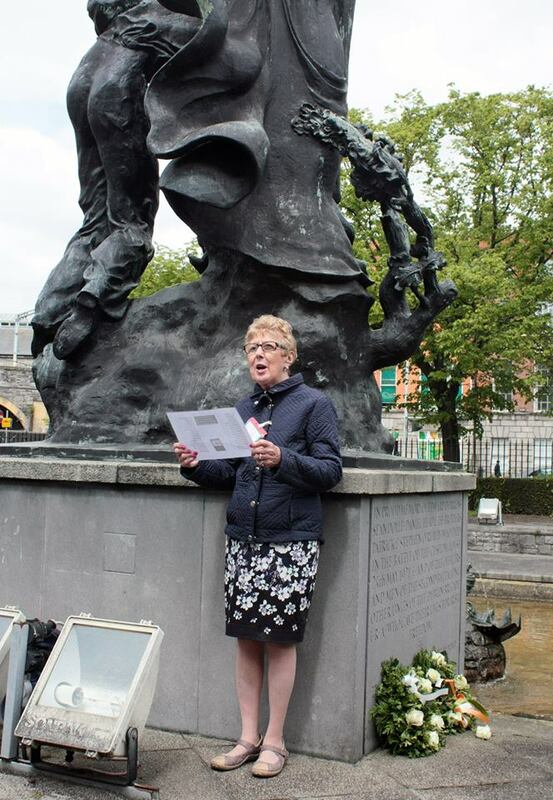 Nuala Ennis MacDonald reads the roll of honour part one. Jim Dolan made a video recording of the commemorations and Gerry Cassidy double-jobbed by taking group shots. Gerry Cassidy reads part two of the roll of honour. Tom Kehoe laying the wreath for the IRA men who died at the Custom House 2016. Colum Lawless laying the wreath for the four civilian dead 2016. There was also a special souvenir badge given out on the day to the first 80 people who arrived. We were pleased to welcome, as first time attendees, relatives of more of the people at the Custom House in May 1921, including a particularly sizeable contingent from one family. It was also great to see so many returning after previous commemorations. Attendance reached a new high of around 120 people. The conference was again held in the building with a packed programme of talks by Sean Hogan, Sgt Paul Maher (Garda Museum), Liz Gillis, Paul O’Brien, Des White, Las Fallon & Mícheál Ó Doibhilín. For the future we intend to keep on going the way we have been, adding new features as we go on. We intend to stay an independent group with NO political ties whatsoever. All we are interested in is making sure those who fought & died at the Custom House are given the honour & respect they deserve & the wreaths are laid by family members or people who are interested in helping the commemoration and not driven by political or other motives.